Two brothers. The heist of a lifetime. The stakes: their survival. After escaping from the back rooms of Washington, Mike Ford is now playing for his life against the titans of Wall Street. Mike’s brother has been trapped in a powerful conspiracy to steal a secret worth billions from a hidden linchpin of the American economy: a real-life, little-known trading desk at the Federal Reserve Bank of New York. Forced to choose between an honest life and his only sibling, Mike returns to the dark skills of his past in order to accomplish the job himself. Cornered by the dangerous men in high places, he will beat them at their own game or die trying. 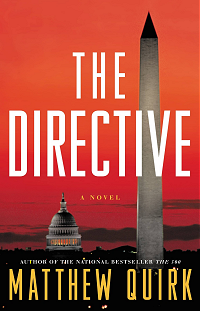 The Directive is Matthew Quirk’s follow-up to his national bestseller The 500, which was nominated for the Edgar Award and won the International Thriller Writers’ and Strand Critics Award for best first novel. The protagonist, Michael Ford, returns in a sequel that combines sharp narrative voice with fast-paced suspense. Both books have elements of some of the greatest, bestselling thrillers of recent memory, including The Firm and the novels of Harlan Coben and Lee Child.